Hiroi-sensei and Maeda-san have appeared many times in Japanese newspapers. Below is a translation of an article entitled “Moved from Toshima, To Train in Akiu: Maeda from the Izu Islands” that ran January 10, 2008 in the newspaper Kahoku shinpō. See the original Japanese article at the link below. Maeda makes traditional artworks using reclaimed camellia wood, which is difficult to work with. This man is Maeda Ryōji (26). While working a part-time job at a gas station in Sendai, he commutes to the “Komaya [Top Shop] Hiroi” workshop and is learning how to make tea cups, saucers, and tops. The Hiroi workshop is managed by Hiroi Michiaki (74), one of the seven artisans of the Akiu Craft Village Work Association. Maeda, after helping with his parent’s fishing business, worked at a company in Tokyo. In spring of 2004, he came to sell camellia oil at a product fair in Akiu Craft Village, where he by chance met Hiroi and developed an interest in traditional arts. In fall, he moved to Sendai. 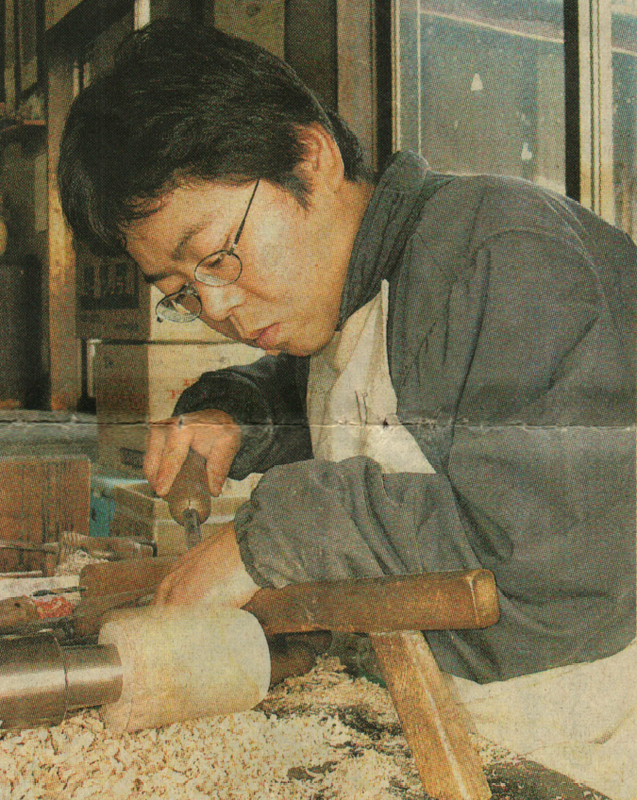 In 2004, at the suggestion of local planner Aizawa Yū (51, Izumi Ward), the Work Association began a project to create new traditional craft pieces using reclaimed wood from Toshima. They received a donation of camellia wood from Toshima village and began their exchange selling kokeshi and accessory cases they made from it. Compared with dogwood and other trees used for wooden toys, camellia has numerous hidden knots in the wood and becomes extremely hard when dried, making it difficult to work with. The products made from camellia have a particular texture and tint to them that give them a high-quality feeling. A map of Toshima 利島 off the coast of Tokyo and Yokohama. “I don’t think there are any woodworkers in Japan that use camellia. I want to guide Maeda so he can readily become an independent artisan,” Hiroi said enthusiastically. Toshima 利島 is located 140 km south of Tokyo. The population of the island, which spans about 8 km in circumference, is around 300 people. More than half the island is covered with around 200,000 camellia trees, whichproduced about 14.5 kiloleters (3830.5 gallons) of camellia oil from their seeds a year in 2006–an estimated 60% of all of Japan’s camellia oil.